You can learn to produce your own queens using this small, but scalable system. I’m a beginner. This has been my second year raising queens – my third year keeping honey bees. So I am in no way pretending to be any kind of an expert – not only have I made many mistakes, but I expect to make many more next year. As one beginner to another – I think I might have some useful insights into getting started in queen rearing. Plan to practice rearing queens when it’s easiest – during the main flow/swarm season, that is – late April/Early June in Mid TN – when the bees want to reproduce. It can be done earlier and later, but it’s a lot more difficult. This is from the notes I took at an excellent session at the Heartland Apiary Society gathering in Cookeville, TN July 8-10, 2010. I’ve tried to accurately record the instructions that were given, but it is quite possible that I’ve gotten something wrong. Caveat Emptor and all that. Everyone won’t agree with all of this – that is a given among bee keepers – but I’ve tried not to interject my opinion at all. This post is probably not going to be very interesting unless you keep honey bees – Or want to become a bee keeper. Sorry about that, but there will be more gardening content coming soon. Queen Bees – The heart and soul of a honey bee colony is the Queen. Every hive has just one (with few exceptions) and if she is healthy, good natured, and productive she will pass those traits on to all of her daughters – the worker bees – and all will be good. A bee keeper needs new queens to replace failing older queens, and to establish new hives and grow their operations. If a hive becomes queenless for very long it’s production and health will suffer, and eventually the colony will die. Hives with old queens are more likely to “swarm” – an event where the hive splits itself and half of the bees flying off to make honey for their selves instead of for the bee keeper. So replacing old queens with new ones every year is also a way of preventing swarms. Queen Rearing – Most bee keepers order new queens by mail (when they are available) for about $20 each plus shipping. Others raise (or allow the bees to raise) their own queens one at a time like nature does. These videos are of what is called queen “rearing” – producing viable queens in batches. At a value of $20.00 each the ability to rear even small batches of queens could make a big difference in the economics of a small apiary. Being able to have queens when you need them instead of having to wait for one to come through the mail, and having some control over genetics are also factors in favor of learning this craft. In the first video very young (probably one day old or less) worker larva are being removed from a frame of brood comb and placed into wax cups using a wire grafting tool. BTW, all workers are female. The larva are very small – about the size of a comma. Wax cups roughly the size of a small thimble are either manufactured or are home made by dipping a wet wooden peg into liquid wax. Those cone shaped bee hives are called skeps, and I’m pretty sure that the two simple wooden boxes are bee hives too. In most (if not all) of the United States the law requires that bees be kept in “modern” hives which can be opened and inspected. This marvelous picture is one of many extraordinary images that you can see at The Bee Photographer – www.thehoneygatherers.com. BTW – that is not me in the picture. I’ve really enjoyed my first summer keeping bees – Working with, observing, and learning about the bees has been very interesting and enjoyable. Before I started I read a lot about the subject, but inevitably experience teaches things that I didn’t pick up on during months of study. You have to feed bees – And it is more expensive than you would think – ideally bees feed their selves, but if you are trying to increase the population of your apiary you will probably have to feed sometimes – BTW most hobby bee keepers feed their bees syrup made out of plain old granulated sugar. I haven’t kept up with it, but I wouldn’t be surprised if I’ve bought $50 (or more) worth of sugar to feed my 1 1/2 hives of bees this year. When I feed my bees syrup I use a quart jar with a few small holes in the lid. This spring after I wrote “Anyone Can Raise Rabbits” my wife and I decided to get back into rabbit raising – something that we did for a while almost 20 years ago. I haven’t mentioned this up until now because I wanted to have something more informative than just cute pictures of our rabbits. We started out with 4 young “New Zealand” rabbits – 3 does and a buck. The reason that I put New Zealand in quotes is because we did not buy pedigreed stock from a breeder. We bought Easter bunnies which we found in online classifieds. However our rabbits conform pretty well to the New Zealand standard. New Zealands are especially good for meat production, and make good mothers – not very nervous or prone to lose, abandon, or kill their litters like some other breeds might often do. New Zealands are the stereotypical “white Rabbits”. We’ve just completed one “cycle” of backyard rabbit raising and I thought that some of you might be interested in how it comes out in the real world. One week old baby New Zealand Rabbit - Grow fast don't they? We raised a total of 10 baby rabbits from two litters. In the 10 weeks beginning with when the two mothers were first bred we fed 3 – 50 lb bags of commercial rabbit feed at $15 per bag – for a total of $49.00 more or less including tax. As soon as the bunnies were old enough to ween (7-8 weeks) we advertised them for sale on Internet classifieds and eventually sold 4 for a total of $38.00. When the babies were 10 weeks old they were almost as big as their mothers, and the time had come when they could no longer remain in the same cages with them any longer. We would have been happy to have sold all of them if possible, but the plan had always been to use any that we couldn’t sell by 10 weeks for food. So that is what we did. The remaining 6 rabbits yielded about 18 pounds dressed weight of meat at a total cost of 61 cents per pound based upon the cost of rabbit food minus the proceeds from the sale of live rabbits. In addition we also got quite a lot of weed free high quality organic fertilizer for our garden. According to the university of Maine ag department fresh rabbit manure has an analysis of 2.4-1.4-0.6 NPK ratio which is about 1/2 that of store bought “organic” fertilizer from the home improvement store – which is actually pasteurized, processed chicken feathers, manure, and by products from a commercial factory farm. If you compare it to that stuff we got an easy $25 worth of fertilizer out of the deal. In addition to the breeding does and their litters we were also maintaining the buck / sire, and one idle (unbred) doe during the same time period – both of which were also fed out of the same allotment of rabbit feed as the working does and bunnies. So the total feed conversion rate of our little rabbitry was about 5 pounds of feed consumed per each pound of dressed meat produced – including what would have been yielded by the 4 that we sold. Really not too bad for a very small first effort. I might point out that even though this isn’t all that bad (nor all that great) That we can conceivably improve our efficiency in the future. For one thing we won’t usually have an unbred doe just taking up space and consuming food. Also, 5 offspring per litter is low, and I believe that will improve – these are first litters for these does, and subsequent litters are likely to be larger. Also there is a breeding technique that I wasn’t previously aware of that is supposed to increase the litter size. Obviously I’m not including the cost of the initial investment in cages and other equipment or breeding stock. Even so this is certainly not a get rich quick scheme, and if you value your time at all then it’s an exercise in futility. You would certainly be better off financially to work an hour or two of over time and just buy your food at Wal-Mart. Of course from that point of view it’s probably also cheaper to just feed your kids happy meals than to fix them a home cooked supper. Though if that’s how you looked at it you wouldn’t be reading this blog would you. This is a brand new (and nearly perfect) frame of honey bee brood. Click on the picture for a closer look. Not brood as in introspective and depressed – brood is the term for pre-adult honey bees. The queen lays an egg in a cell (up to 2000 a day) and 3 days later it hatches out into a larva – on day 8 the workers put a wax cap on it – where it meta morphs like a caterpillar into a butterfly. A few days later (depending on what caste the bee is destined for) an adult bee emerges. I promise that this isn’t going to turn into a blog just about honey bees, but I think this is pretty cool and I thought some of you might be interested. Click on either picture in this article and you’ll get a high resolution version that you can zoom in on – hold the ctrl button and hit the + key to zoom in. Look closely now - in the uncapped cells you can see white larva curled up in all stages of development. The white capped cells at the top of the frame contain honey - I think. The tan cappings lower down contain baby bees. The cells that look empty actually have either eggs or larvae that are too small to see. Right in the center of the picture you can see a bee with her head stuck down into a cell - she's feeding a baby. Click on the picture for a much higher definition view. If you’ve been following my progress as a bee keeper you can see from these pictures that the bees have stopped building crooked comb and are now building 2 frames of comb like this about every 3 days. Because of a mistake which I made my bees built crooked comb across the frames instead of inside of them. One week after putting my mail ordered package of honey bees into the hive I opened it up to see what had transpired. I wanted to check sooner but cold rainy weather prevented it. What I was hoping to find in there was lots of nice straight parallel comb built from the guides on the top bars of the frames. And that is probably what I would have found if I had followed Michael Bush’s advice to not put the queen cage inside of a foundationless hive or they would be likely to build crossed comb off of it. Maybe I’ll listen next time. This is the kind of mistake that rookies (like me) make. After I cut the queen cage out and brushed off the bees you can see that they built in two different directions across the frames instead of parallel with the frames. Once they got started wrong they just kept building parallel with the initial crooked comb. I rubber banded the combs into the frames, and twisted it all around as straight as possible. There was probably about 3 frames worth of beautiful new comb (I hived the package of bees one week before) that were running across the frames, and when I opened the hive most of it collapsed. Plus about 3/4 frame total that they had built more or less correct. I hope that I got all of it right side up at least – I doubt it though. That nice piece there on the right actually grew there – I banded it in to keep it from falling out while I worked on the crooked one that crossed right next to it. The dark areas of comb are pollen stores, and the cells above that are full of uncured honey. What I didn’t realize at the time was that most of the lower parts of the combs were already full of brood – eggs and baby bee larva. I never spotted the queen – she wasn’t still in the queen cage though. I was careful and the bees were really mild so the carnage wasn’t too bad despite this being the first time I ever even saw the inside of an active bee hive. I did a fair amount of damage to some of the comb, but considering it was only a little bit more firm than biscuit dough I think I did alright for my first time. A few days later I spotted some capped brood – 8 day old larvae which are in the pupal stage of development, like when a butterfly is in it’s cocoon. At that point I knew that the queen had been busy laying eggs. At the rate they were going up till now I think that the 8 frame medium hive body they are in would’ve been full of comb in another week. I’m sure this is a speed bump at least, but I’m thinking I should check back in 4 days or so to make sure, and to try and find the queen. I hope this gets them going more or less straight. Three days later I looked in to see how the repairs were going. Already attached and running straight – so far. When I rubber banded it in the comb was so soft that even being as careful as possible I did a fair amount of damage to it, but the bees got to work and fixed it all up. There were some other frames that looked a little more lumpy but they were all attached well and expanded somewhat. It looks to me like that even with the set back they are building about 1/2 frame of comb a day. I looked pretty hard, but still didn’t spot the queen (or eggs) , but I figure that in another 3-5 days I should be able to spot larvae if all is well. I later saw some brood in the pictures that Shirley took during this inspection. Photography again by my lovely and fearless wife Shirley who stood 15 feet away without a stitch of protective gear to take these pictures. My new bees hanging out at the hive entrance. The honey bees that I ordered last January arrived in the mail today – actually 4 weeks ago – but that’s when I started this post. As soon as I picked them up at the post office I misted them with some cool water – they were definitely thirsty – as soon as they got out of the box later they started lapping up water wherever they could find it. Since it was a little bit cool today the bees rode in the cab of the truck to keep them from being chilled on the ride home. A 3 pound package of bees as it comes through the mail. The first thing I did to get the bees into the hive was to take out 4 frames to make a space for the bees – then pry the plywood cover off of the package. The bees will hopefully build nice neat comb in the frames. I’m using wooden starter strips instead of wax foundation and this is my first ever hive of bees so the frames are completely empty. The package contains a can of syrup with a few holes in it for the bees to eat as they move through the mail system. I'm holding the metal tab that the queen cage is hanging from as I very slowly remove the syrup can. Everything has bees clinging to it so you have to go slow and kind of wiggle things around to keep from injuring them. After removing the can I kept the bees in the cage by laying the little piece of plywood back over the hole. Notice the white wax that the workers deposited on the queen cage while they were in route. They really can't wait to get to work. You can't see the queen in this picture, but she's been marked with a spot of florescent green paint to make her easier to find. The queen is confined in this cage that comes hanging in the package. The queen and worker bees were collected from different hives at the commercial apiary where the bees were produced, and don’t immediately accept each other – although the bees that are clinging to the queen cage seem to have because I could see them feeding her (I think). Anyway, the queen cage has a cork that keeps the queen in for the trip, and under the cork there is supposed to be a plug made out of sugar “candy” that the workers will gnaw away to free the queen. Unfortunately when I removed the cork there wasn’t any candy – so I put the cork back in and went and got a piece of bread to plug the hole with. If the queen is still in the cage in a few days I’ll release her during the first inspection. I should have prepared for this possibility by equiping myself with a marshmallow to plug the hole. I’m not to worried though – if they don’t eat the bread and free the queen they will feed her through the cage, and she’ll be fine. I hope. Don't do this - When introducing a queen into an empty box without foundation just free the queen and put the queen cage in your pocket - seriously don't leave the cage laying around or the bees might cluster on it because of the queen pheremones on it. If you do what I did in this picture you will probably also have to repair the crossed comb that they will build. After I removed the cork and improvised a plug I hung the queen and her attendants from one of the frames near the center of the hive. I’ve seen pictures of people having to bend nails and whatnot to improvise a hanger, but the strip of soft sheet metal that this package came with seems to be way easier to use. I found out a few days later that this was a horrible mistake – the bees started building comb off of the queen cage instead of from the starter strips in the frames. More about that later. Usually in package bee installation how tos you are instructed to shake the bees out through the 3 inch hole left by the syrup can – lots of shaking involved which doesn’t look too pleasant for the bees. However I just took the screen loose on the side of the box to open up the entire side as instructed in this beemaster video on installing a package of bees. Then the whole bunch comes out with very little effort or trauma to the bees. Now just carefully replace all of the frames – slowly wiggle them in to give the bees a chance to get out of the way. It seems impossible from the way this picture looks, but I don’t think I killed a single one. Now carefully replace the inner cover. That piece of plywood with the round hole and screen is just laying over a corresponding round hole in the inner cover. My idea is to feed the bees without them getting into the upper chamber. We’ll see how it works. By the way I made all of the hive parts except the frames from scratch. I’m planning to use 8 frame medium depth hive bodies for everything. Notice that the bees aren’t attacking me at all. I doubt if I would have been stung even without the bee suit – but It’s going to be a while before I get that cocky. The jar of syrup has a few holes punched in the lid and goes right over the screen. If they drink that too quick I’ll use a gallon paint can later. Now an empty hive body, and the outer cover. If I had been on the ball I would have placed the entrance reducer before I started. The stick that you can see is corking up the vent hole in the innner cover. In just a few minutes the bees were all moving inside and flying around the yard orienting themselves. In a few hours they were already bringing in pollen from the blackberry flowers. This process might look intimidating, but after all of the waiting I really enjoyed the whole thing – I didn’t get stung. I had worried that when I dumped all of those bees out they would all just rise up and fly away if I didn’t do everything exactly right. But the thing is they don’t seem to want to fly away. It’s almost like if you had been cooped up in a greyhound bus for 3 days and then you were deposited right into a five star hotel with an open buffet – what they really seemed to want to do was settle in and make theirselves at home. Photography by my lovely and fearless wife Shirley – who was not wearing a bee suit. I went for a walk today – down the hill through the woods, through the meadow, and around the pond. The air is like perfume with the scent of honeysuckle and blackberry flowers – freshly washed from the 10 or so inches of rain we’ve had in the last 2 weeks – birds singing, squirrels doing squirrel things, horses grazing in the meadow. It’s a beautiful spring day, but one thing was missing – honey bees. I didn’t see a single one. That’s all about to change. Back in January I placed an order for a 3 pound package of bees which are due to come in the mail (I bet the mail man loves that!) any day now. That’s about 10,000 girls to do all the work (as usual), and one queen to lay all the eggs – when the drones emerge they’ll pretty much just hang out and chase the young queens (like college boys in insect form). With any luck my colony will thrive and increase, and eventually I’ll be able to split it into several hives which will produce honey and pollinate not only my garden, but every garden within almost a mile. Ive been reading, studying and building bee hives for most of a year now to prepare for that package of bees to arrive in the mail. It’s like I’m 8 and it’s Dec 24th. When I was a kid (not all that long ago) honeybees were everywhere – in all the flowers and working the clover in the yard. They were an integral part of being outdoors. Not so anymore. Honeybees are having a hard time, and even the experts don’t know exactly what the problem is. Colony Collapse Disorder is what they’ve started calling it when a whole hive of bees just disappears for no particular reason – some bee keepers have lost 1/3 of their colonies in a single year to CCD. 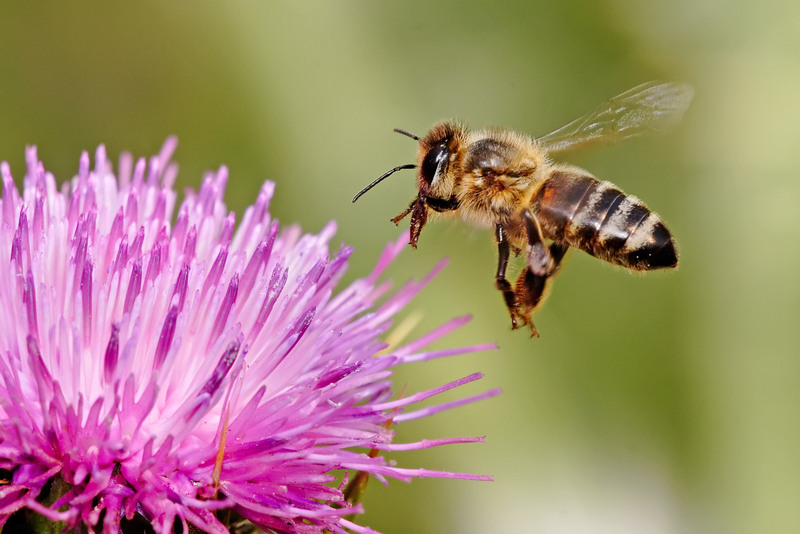 Bees have always been known to “abscond” when their nest developed a persistent problem – invading ants, raiding skunks, neighbors with loud music – that sort of thing, but CCD is different. CCD might be caused by a combination of things – exotic mites and diseases, rampant use of petrochemical poisons, cell phones, global warming, deficit spending – It’s hard telling what all. But the effect is that bees are experiencing a failure to thrive both in domestication and in the wild, and you just don’t see nearly as many as you used to. You might have noticed in your garden things like cucumbers that only develop on one end, or healthy squash vines that don’t seem to produce like they should. These are symptoms of inadequate pollination. Farmers of certain crops must have plenty of honey bees to make a profit – so they hire commercial bee keepers to bring them in. The bees just can’t be done without. Backyard beekeepers can be part of the solution by acting as a kind reservoir – domestic bees “escape” into the wild as a matter of course, and also mate with wild bees – for better or worse. Also, as I mentioned – One hive of bees can help with pollination for a large area. Some hobby beekeepers seem to be making real progress in overcoming the problems by using natural methods and breeding – I would like to be a part of that. Commercial beekeepers are having enough problems just trying to make a living without experimenting with organics, so that is probably going to be left almost entirely to hobbyists and dedicated small operations. Almost all commercial bees are treated with various chemicals and medications which almost certainly contaminates both the honey and the wax – I plan to avoid all that. I like the idea of feeding my Grand Children sustainably produced clean honey. It’s a hobby with the potential to make a little bit of money, instead of costing a bunch of it. I’m envisioning a future where that might be a good thing. Honey bees don’t make noise, don’t have to be tended while you go on vacation, and help encourage your good for nothin’ neighbors to stay away from your stuff. What’s not to like? For now, I’ve got nothing to show you, but assuming the post office doesn’t lose my bees I will in a couple of days. In the mean time, please be kind and try not to poison the birds, bees and other wildlife (and yourself) with nasty chemicals – go organic for all of us. Here’s a link to a great place to learn about chemical free bee keeping. Welcome Stumblers! How about a thumbs up if you find this article to be interesting or useful? Anyone can raise rabbits, but then why would you want to? Raising rabbits is enjoyable – the animals are gentle, and interactive – they often “thump” at you when they hear you come outside if they want attention. If you are actually raising rabbits as opposed to just keeping them as pets then you will have litters of baby rabbits on a regular schedule, and that is also enjoyable. Rabbits don’t take up much space, and they make almost no noise at all. They don’t smell as long as the rabbit keeper does his or her part. You are currently browsing the archives for the Livestock category.